This review aims at focusing on the use of microneedles (MNs) as an emerging novel drug delivery carrier for an effective treatment in diabetic patients. There are many limitations in various modes of delivery such as oral, subcutaneous, nasal, and other modes which cause pain and have many other side effects. Hence, this drug delivery research has found to have tremendous potential in combining both the diagnostic and therapeutic elements, thus treating diabetes in a better way. 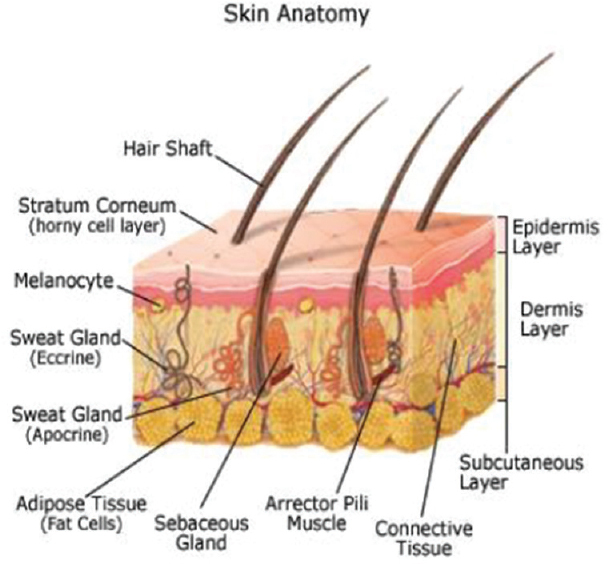 Most glucose-sensing techniques and conventional insulin therapies are engaged in the transfer of physical entities through the skin. MN- based drug delivery system can accomplish in an noninvasive or minimally invasive manner which can be an add on advantage towards pain-free administration, easy handling, discrete, continuous as well as providing a controlled release system. Hence, the review addresses on the current advancement of this bioengineered system like MNs, constituting a “smart” system specifically for autonomous diabetes therapy. BACKGROUND: Good reporting of experimental research is a vital part of research process. Although the reporting guidelines such as Animal research: Reporting in vivo experiments (ARRIVE) require the authors to stick to a standard format, they do not guarantee study reports' validity. For assessing the study reports validity, critical appraisal tools are required. 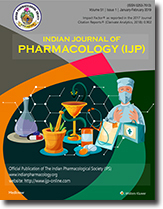 OBJECTIVE: The evaluation of the methodological quality of in vivo animal studies of Indian Journal of Pharmacology (IJP) published between 2011 and 2017 through critical appraisal was the primary objective. The secondary objective was to evaluate the adherence of selected studies to the ARRIVE guidelines. MATERIALS AND METHODS: All in vivo animal studies published as full-text articles in IJP from January 2011 to December 2017 and satisfying the inclusion norms were included. A checklist based on the underlying principles of ARRIVE statement was applied to in vivo animal research (AR) published in IJP. For critical appraisal of reports, risk-of-bias domains were also applied on studies from in vivo AR. RESULTS: One hundred and sixty-one studies satisfied the inclusion criteria. 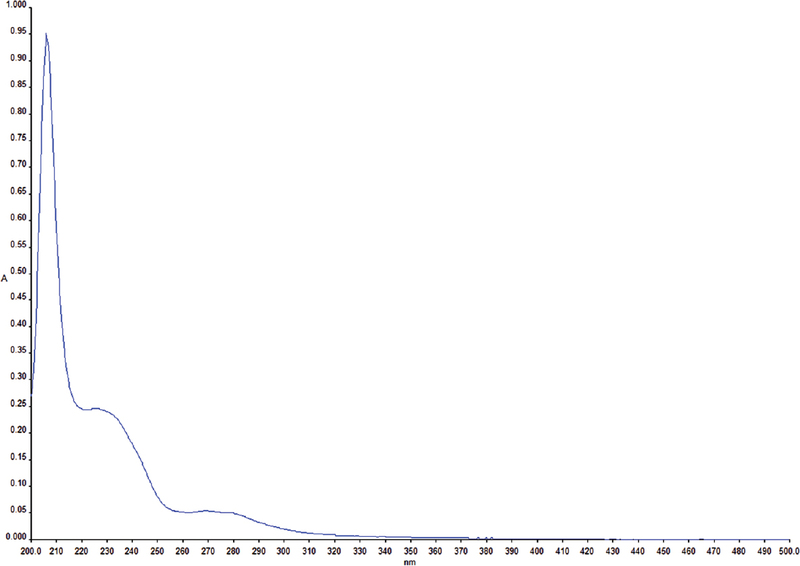 Seventy-three articles (45.34%, 95% confidence interval [CI]: 0.37–0.53) discussed about randomization procedure. Eighteen articles (11.18%, 95% CI: 0.07–0.16) gave details about blinding when assessing results. None of the studies provided details of sample size calculation. 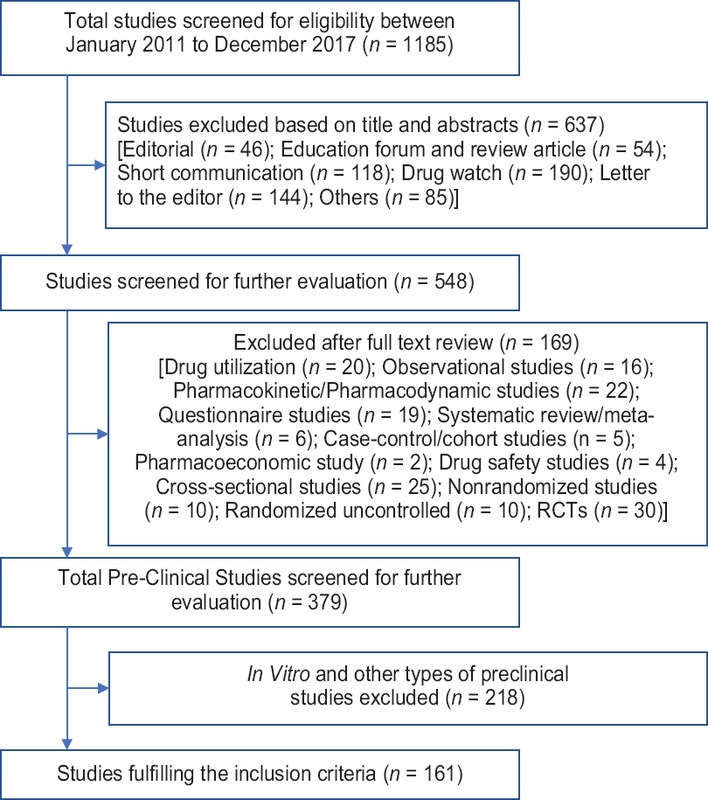 Eight articles (4.97%, 95% CI: 0.02–0.09) commented on the study limitations. CONCLUSION: It was found that adherence to only some criteria of ARRIVE guidelines was subpar. 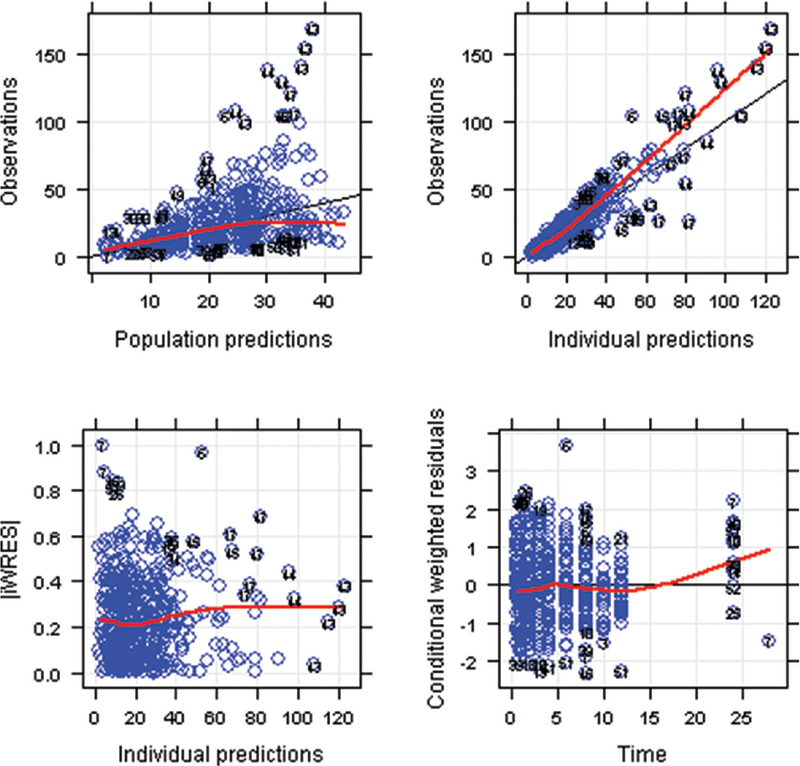 There is a need for optimal reporting of random distribution of animals to experimental groups, concealment of allocation, blinded outcome evaluation, computation of sample size, and attrition of animals for improving the validity of AR. OBJECTIVES: We attempted to develop a population pharmacokinetic model for primaquine (PQ) and evaluate the effect of renal and hepatic dysfunction on PQ pharmacokinetics. MATERIALS AND METHODS: The data were collected from a prospective, nonrandomized clinical study in healthy volunteers and patients with mild-moderate hepatic dysfunction and renal dysfunction. Model development was conducted using NONMEM® software, and parameter estimation was conducted using first-order conditional estimation with interaction method. RESULTS: Final data included a total of 53 study participants (13 healthy individuals, 12 with mild hepatic dysfunction, 6 with moderate hepatic dysfunction, and 22 with renal dysfunction) with 458 concentrations records. Absorption rate constant (Ka) was constrained to be higher than elimination rate constant to avoid flip-flop situation. 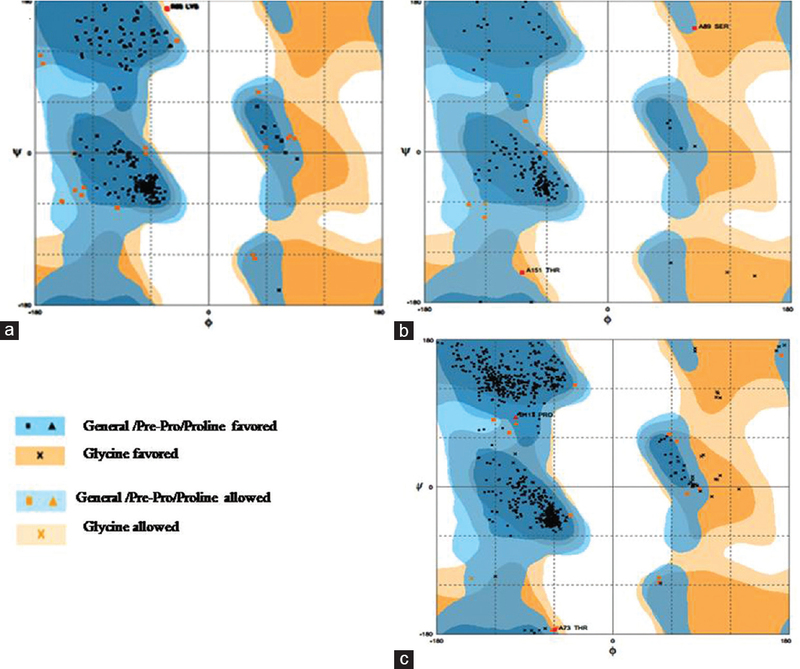 Mild hepatic dysfunction was a significant covariate on volume of distribution, and it is approximately three folds higher compared to other subjects. Fixed effects parameter estimates of the final model – absorption rate constant (Ka), volume of distribution (V), and clearance (CL) – were 0.95/h, 498 L, and 39 L/h, respectively. Between-subject variability estimates (% CV) on Ka, V, and CL were 77, 66, and 65, respectively. Residual error was modeled as combination error model with the parameter estimates for proportion error 12% CV and additive error (standard deviation) 1.5 ng/ml. CONCLUSION: Population pharmacokinetic modeling showed that the volume of distribution of PQ in subjects with moderate hepatic dysfunction increases approximately three folds resulting in a significantly lower plasma concentration. OBJECTIVE: Bauhinia purpurea (BP) Linn. (Caesalpiniaceae) is a plant of great medicinal importance and has been used since ancient times for treating many inflammatory conditions including arthritis. 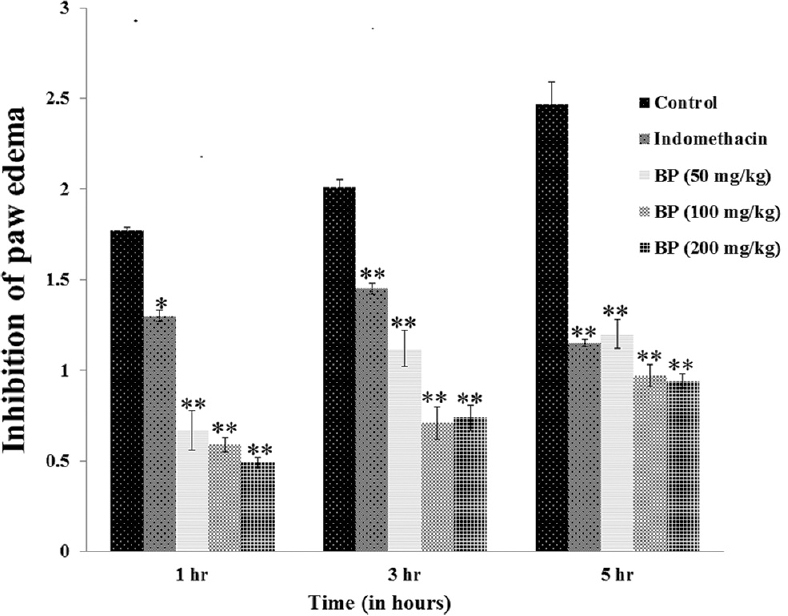 This study investigates the anti-arthritic potential of the hydroalcoholic extract from the stem bark of BP. MATERIALS AND METHODS: The anti-inflammatory and anti-arthritic activity of BP at various doses was used to evaluate its anti-inflammatory activity and anti-arthritic activity. Serum of arthritic rats was collected at day 21 for detecting serum cytokines level and to evaluate the effect of BP on its serum level. Furthermore, the safety of BP was evaluated in acute (5 days) and subacute (28 days) toxicity study in rats. RESULTS: There was a significant inhibition (P < 0.01) in paw edema at a different time scale with different doses of BP (50, 100, and 200 mg/kg). BP also demonstrated dose-dependent anti-arthritic activity on all observation days (3, 7, 14, and 21). In addition, there was also a significant decrease (P < 0.01) in oxidative stress markers, circulating pro-inflammatory cytokine (tumor necrosis factor alpha from 45.91 to 37.44, interleukin-1 (IL-1) β from 18.24 to 16.06, and IL-6 from 69.77 to 58.44) and an increase in anti-inflammatory cytokine (IL-10 from 8.07 to 12.07) levels. BP was found to be safe with an oral LD50 value of >2 g/kg in acute toxicity study and also no toxicological effect was observed in the oral subacute toxicity study. CONCLUSION: This study demonstrates that BP bark possesses anti-arthritic activity potential and confirm its folklore use in the treatment of inflammatory conditions. CONTEXT: Homology modeling plays role in determining the therapeutic targets dreadful for condition such as neurodegenerative diseases (NDD), which pose challenge in achieving the effective managements. The structures of the serotonin transporter (SERT), aquaporin (AQP), and tropomyosin receptor kinase (TrkA) which are implicated in NDD pathology are still unknown for Lumbricus terrestris, but the three-dimensional (3D) structure of the human counterpart for modeling. AIM: This study aims to generate and evaluate the 3D structure of TrkA, SERT, and AQP proteins and their interaction with the ligands, namely Asiaticoside-D (AD) and levodopa (L-DOPA) the anti-NDD agents. SUBJECTS AND METHODS: Homology modeling for SERT, AQP, and TrkA proteins of Lumbricus terrestris using SWISS-MODEL Server and the modeled structure was validated using Rampage Server. Wet-lab analysis of their correspondent m-RNA levels was also done to validate the in silico data. RESULTS: It was found that TrkA had moderately high homology (67%) to human while SERT and AQP could exhibit 58% and 42%, respectively. The reliability of the model was assessed by Ramachandran plot analysis. Interactions of AD with the SERT, AQP-4, and TrkA showed the binding energies as −9.93, 8.88, and −7.58 of Kcal/mol, respectively, while for L-DOPA did show −3.93, −5.13, and −6.0 Kcal/mol, respectively. The levels of SERT, TrkA, and AQP-4 were significantly reduced (P < 0.001) on ROT induced when compared to those of control worms. On ROT + AD supplementation group (III), m-RNA levels were significantly increased (P < 0.05) when compared to those of ROT induced worms (group II). CONCLUSION: Our pioneering docking data propose the possible of target which is proved useful for therapeutic investigations against the unconquered better of NDD. BACKGROUND: In recent years, drug testing in body fluids has gained popularity for validating self-reported drug use. The storage and transportation of urine specimens is a major concern for remote areas where the facilities for performing drug abuse testing are lacking. AIMS AND OBJECTIVES: The aim of the present study was to develop an efficient method for testing opiate in dried urine spots (DUS) and to evaluate its clinical applicability. 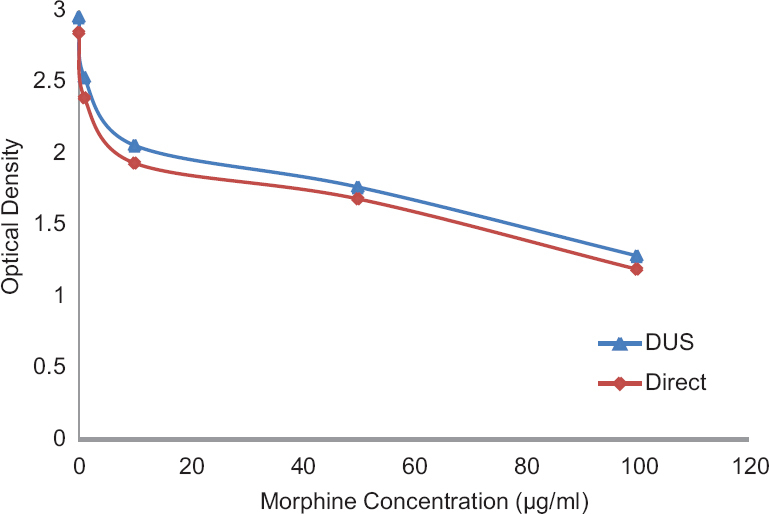 MATERIALS AND METHODS: The methodology involved optimization of conditions for extraction, recovery, short-, and long-term stability (room temperature, 4°C,−20°C) for detection of opiate from dried urine spots. Further, the extraction efficiency from dried urine spots was compared with the conventional drug testing methodology. The screening was done by using enzyme-linked immunosorbent assay technique, and confirmation was achieved by gas chromatography equipped with nitrogen phosphorus detector. RESULTS: Deionized water was found to be a suitable extracting solvent compare to bi-carbonate buffer (pH 9.2) and saline. Primary screening was achieved by 2 punches taken from a 20-μl (diameter 1.3 cm) spotted urine samples, whereas confirmation was achieved by 2 complete circles each of 20 μl sample volume. The recovery was found to be 99.41% in water. No sign of significant degradation was seen among all storage conditions. CONCLUSIONS: In the current study, DUS has achieved the same level of precision and reproducibility as that of standard methods used for drug testing in urine. Hence, the DUS sampling appears to have potential to detect opiate among drug users in a clinical setting. OBJECTIVES: Sophorolipids (SLs) are a group of surface-active glycolipids produced by a type of nonpathogenic yeast Candida bombicola in the presence of vegetable oil through fermentation technology. SLs have shown antitumor activity; however, the mechanism of action underlying the anticancer activity of SLs is poorly understood. This work evaluated the anticancer activity of SLs fermented from palm oil by exploring its antiangiogenic activity. MATERIALS AND METHODS: The SLs that were fermented and further characterized for their biochemical activities. Cytotoxicity study was performed to assess cytostatic properties. A series of in vitro and ex vivo angiogenesis assay was also carried out. The relative fold change in the expression of p53 mRNA by SLs was also studied. RESULTS: Altogether, the data show that SLs derived from palm oil fermentation process inhibited neovascularization in the ex vivo tissue segments and also the endothelial cell proliferation between 50% and 65% inhibition as a whole. The palm oil derived SLs also caused downregulation of the suppression level of vascular endothelial growth factor and also upregulate the p53 mRNA level. The analytical studies revealed the presence of high amount of phenolic compounds but with relatively weak antioxidant activity. The gas chromatography-mass spectrometry studies revealed abundant amount of palmitic and oleic acid, the latter an established antiangiogenic agent, and the former being proangiogenic. CONCLUSION: Therefore, it can be concluded from this study that SLs derived from fermented palm oil have potent antiangiogenic activity which may be attributed by its oleic acid component. BACKGROUND: Chronic kidney disease (CKD) is a worldwide public health problem associated with an eight- to ten-fold increase in cardiovascular mortality. Among patients with CKD, on drug treatment, we aimed to determine the characteristics, etiology, patterns and rates of drug use, and outcomes and factors determining the outcomes at 6 months. 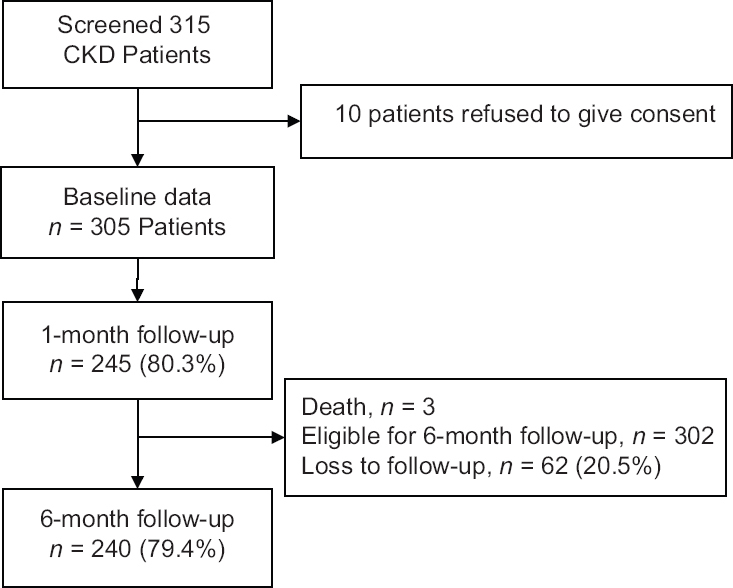 METHODS: We conducted an observational follow-up study on inpatients with CKD at a tertiary care teaching hospital in South India. We collected data on patient characteristics, comorbidities, treatments at baseline, and treatments and outcomes at 6 months. We used Chi-squared tests and Cochran's Q-test to compare categorical variables, t-tests to compare continuous variables, and a multivariable logistic regression analysis to estimate the determinants of the outcome. RESULTS: We recruited 305 patients with the mean age 52.98 (±14.89) years, 73.1% were male and 55.4% patients were from a lower-middle socioeconomic background. About 72.1% were in CKD Stage 5 and 37.0% had diabetic nephropathy. Antihypertensives (84.6%) were the most common drug class prescribed, followed by multivitamins (65.2%), proton-pump inhibitors (64.9%), and antidiabetic drugs (32.5%). There was no significant difference in rates of drug use over 6 months. Increased serum creatinine (odds ratio [OR]: 1.29 [1.04, 1.60]; P = 0.017) and lower estimated glomerular filtration rate (eGFR) (OR: 38.23 [3.92, 372.06]; P = 0.002) predicted progression of CKD, and antiplatelets reduced progression (OR: 0.278 [0.09, 0.85]; P = 0.026). CONCLUSION: Diabetic nephropathy was the most common cause of CKD. There was no change in treatments over 6 months. Low eGFR predicted progression and use of antiplatelets reduced progression of CKD. Large multicenter studies are needed to study the variability in patient characteristics, treatment and outcomes to obtain a national picture, and to enable policy changes.